The Cultural Heritage Center is hosting a sad but iconic piece of American History: a replica of President Abraham Lincoln’s casket. The replica is one of 10 that tour the country each year. It was made by the Batesville Casket Company in Batesville, Ind., and loaned to Isburg Funeral Chapel in Pierre. The casket will be on display Feb. 11-27 in the lobby of the Cultural Heritage Center. There is no fee to view the casket, but regular admission fees will apply for the rest of the museum. Authentic down to the smallest details (except for being lined with lead and the silver plate), the replica is 6 feet, 6 inches long, constructed of solid walnut and completely covered in black broadcloth with a white satin interior. 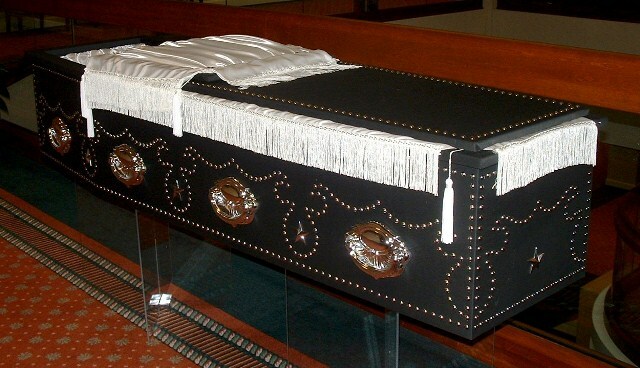 The outside is adorned with silver colored handles and silver tacks, or pearls, extending the entire length of the coffin’s sides. Lincoln’s original coffin included a silver plate in the center of the lid inscribed with his dates of birth and death. This plate is not included on the replica. Additional information about Lincoln’s funeral and the coffin is available at the museum while the casket is on display. The replica Lincoln casket can be viewed 8 a.m.-5 p.m. CST Monday-Friday, 9 a.m.-4:30 p.m. on Saturdays and 1-4:30 p.m. on Sundays. For more information about the work of the South Dakota State Historical Society, visit www.history.sd.gov or call (605) 773-3458.